This time our trip was more relaxed as usual, we more or less joined the overall flow of tourists and enjoyed the country in a slow manner. We didn't run around as we usually do, we didn't look for any crazy adventures. 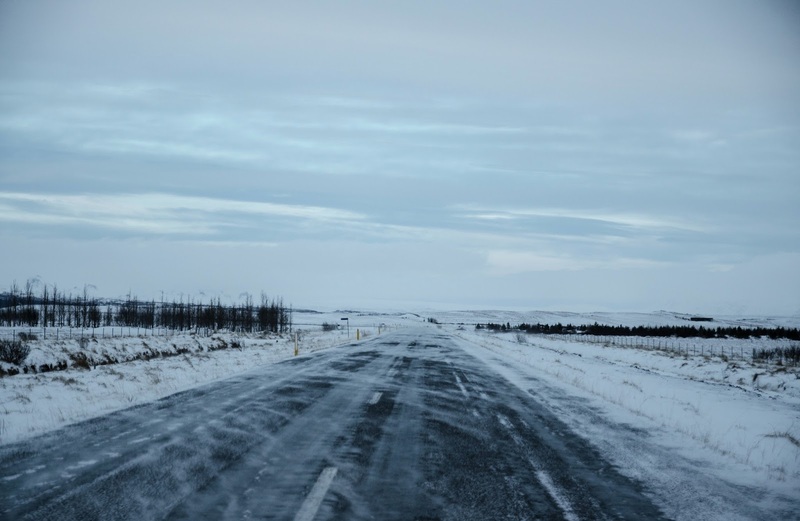 However this article can be useful to those who are wondering – is it worth to go to Iceland in winter? And you know what? We definitely say – "yes, it is". Because in winter there are a lot of advantages that you don't get to experience in summer. If asked what is my one favourite and most vivid memory from Iceland, I would definitely say the landscape with all the snowy mountains around, especially around the Eyjafjallajökull. I suppose you'll say that Alps are also beautiful. 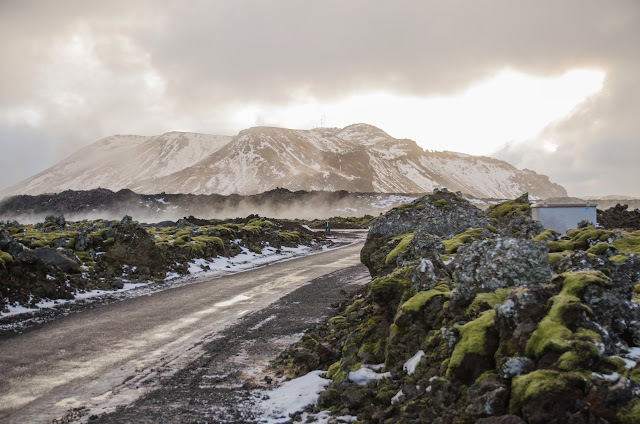 Yes, indeed – Switzerland, Austria and France is really beautiful at this time of the year, but in Iceland in addition you get the feeling and the evidences that each of these mountains can blow-up anytime or it has done so in the recent past. By the volcanoes you can see evidences that they have erupted, buried homes and after all created a new land. In Iceland while travelling between mountains your mind is starting to imagine how our world has been forming many years ago. And the evidences of the volcanic activity are on every corner, even in the air and water. Every time when you open your hot water tap or get out of the car outside the city you feel it – sulphur is in the air and water. The landscape is fantastic all around – the eyes didn't get used to these sights, still every view took the breath away. I still would like to visit Iceland sometimes during the spring of summer, but till then Iceland will remain a real "ICEland" in my mind. ﻿Part 2 of this review can be found here. The photos from the trip to Iceland can be seen on my Facebook profile or here. Why Iceland? This time it's more like a coincidence. In the closing stages of 2013 together with my wife Anna we we're looking for a place to visit in the Christmas holidays. At the beginning we were looking more towards south. We're living ourselves quite far to the north, so usually people of Latvia are trying to go south in the winter months. Our first choice was Milano and the respective district. But when searching for the airline tickets I discovered a good deal from Norwegian airline – cheap tickets from Oslo to Reykjavik. Of course Reykjavik is every travellers dream, so I checked if there is a possibility to get cheap flight from Riga to Oslo. And yes, indeed – Air Baltic – Latvian national airline was offering really cheap tickets to Iceland. At that moment the chance to fulfil the phrase "we would like to get to Iceland sometime" became more realistic than ever. Some two hours of thinking, rough estimates of travel budget, a couple mentionings of our phrase-2013 "when then if not now?" and the tickets were already bought. So quite a spontaneous move. At that moment we really didn't have a lot of time, to go into deeper analysis of our forthcoming trip – we didn't analyse the sighstseeings, weather conditions, prices etc. We started the reservations with hotels. After 5 minutes in booking.com we understood that prices during Christmas time are simply too high for us. So we changed the search engine to airbnb.com. Quite soon we found some suitable options, but we chose a room in a house in Hafnarfjordur (Hafnarfjörður), near Reykjavik. We sent a request to our potential hosts, we wanted to be sure that people we'll be able to host us during Christmas. 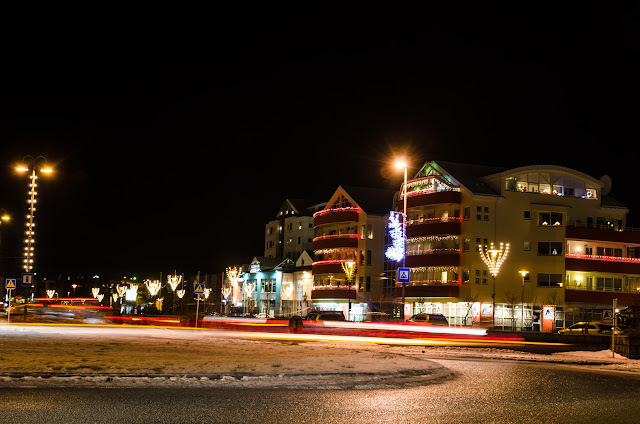 We thought it might be interesting to see how Christmas is celebrated in an Icelandic family. Thankfully to our hosts our request was accepted. In the car rental we booked a VW Polo type car for all the days we were planning to spend in Iceland, still with an option to cancel or modify the booking. We were still thinking about the car for a while. We weren't sure is it better to drive ourselves with a car or just take the bus tours. The problem was that I don't have a driving licence at all and Anna had no driving experience on snow and ice (and very limited driving experience at all – the only experience in the last 5 years was driving in the mountain roads of Azorean islands). It was also unclear about the driving conditions in winter in Iceland. 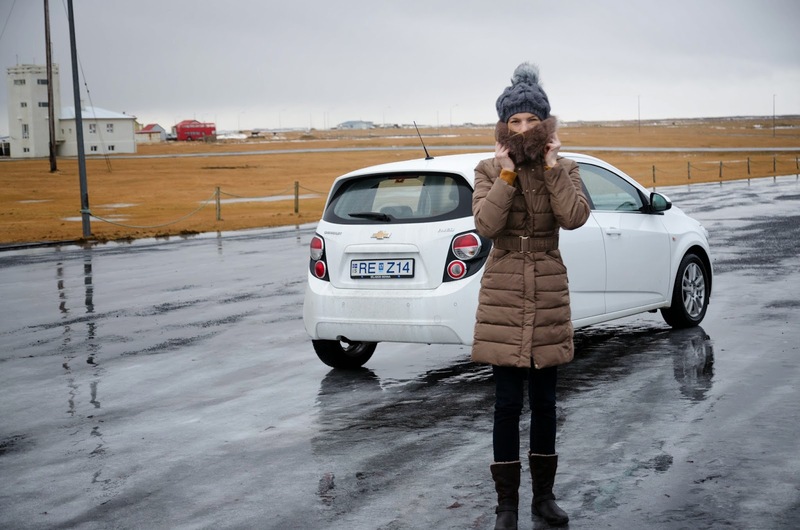 There were a lot of warnings on driving conditions in Iceland, but on the other hand – we didn't believe that the conditions would be worse than here in Latvia J In the end we decided to take the risk and accepted the given to us Chevrolet Aveo. And I must say – that was definitely the right decision – we were more flexible on our trips, we didn't need to pay for the bus tours + in wintertime the car is really cheap. We would take at least 3 bus tours (2 people), but instead we did the Golden Circle, south and northern lights on our own + we drove a lot of beautiful places in addition. Our trip to Iceland was relatively easy. On the day of outbound flight we both even went to work. After the work we visited a nice restaurant in Riga (Olive Oil – if someone is in Riga – I definitely recommend), and then in the evening we had a nice and comfortable flight to Oslo. In the Gardamoen airport we waited some 10 minutes till our transfer bus to hotel arrived (we had to stay the night in a hotel, our next leg of the flight was in the morning). In 10 minutes we were already in our room. Hotel RunWay is a typical airport hotel; it has everything a traveller needs. The breakfast there was outstanding – if we would have known that the breakfast is so good we would have to wake up earlier. J The large variety of the breakfast was impressive – we got to taste the brown Norwegian cheese as well as some local sausages. If you have to fly somewhere thru Oslo, I certainly recommend this hotel. On the next morning we undergone the security checks in the airport and started to wait for our red "Norwegian bird". The airport was very lively, as usual shortly before Christmas. The place was quite crowded, no places in the cafes, but still we wouldn't go there – the prices were simply too high. Both – tea and coffee cost around 5 euro. The airplane was quite large – I didn't notice the model of our Boeing, but the plane was definitely new – the seats were not worn, the baggage compartments were larger and more convenient, and the aircraft interior was styled with neon lighting. The flight was pretty comfortable. I took a chicken wrap from the onboard menu. This was the first time in this trip when I faced anise and cardamom – the two tastes that are so characteristic to Scandinavia. And I don't like liquorice! J But still the wrap was quite good. At the beginning we exchanged some money (we needed some, to get to Reykjavik), but the funny story was that we got lost in the "huge" airport of Keflavik. We haven't lost in the largest airports of Europe, but we simply couldn't find the exit out of the Keflavik airport for some 3-4 minutes. Finally we got out of the airport and found our Airport Express that took us to Hafnarfjordur. There are two bus companies that are operating in the airport – Airport Express and FlyBus. 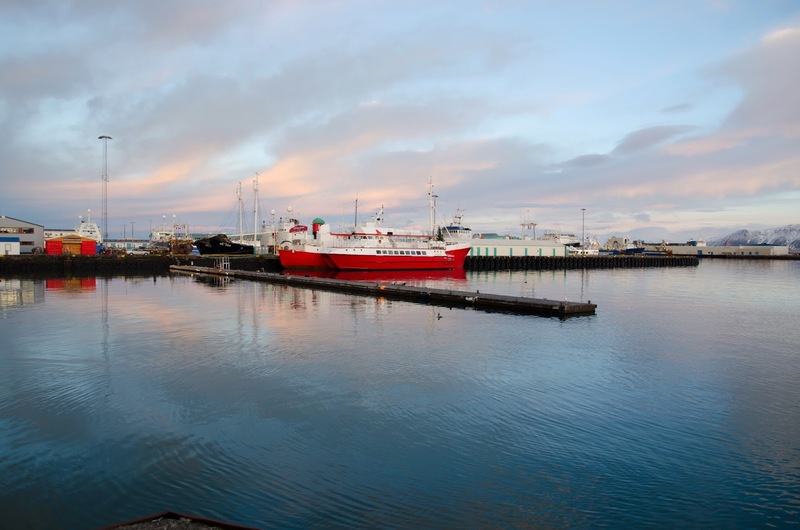 The last one is most popular one – it is more convenient if you travel to the city centre of Reykjavik. But Airport Express is a bit cheaper if you need a transfer spot, like a hotel. As we needed to get to Hafnarfjordur we used the Airport Express. The cost was 7600 ISK (Islandic Kronas) for both of us for a return ticket. That's about 50 euros. The first thoughts on the way to Hafnarfjordur were linked to sun. It was 12:30 pm, but the sun was very low – about 5° above horizon. At that moment it was hard to understand – is it a sunrise, sunset or a zenith. J That was actually a sunrise, but still in this time of the year sun doesn't go much higher above the horizon, maybe some 10°-15° maximum. The landscape around us of course was beautiful and interesting – a snow covered craggy terrain with almost no signs of life – only mosses and lichens. On the way we saw some spruce and pine, but that's it. Our trip to Hafnarfjordur took about 30 minutes. ﻿﻿Hafnarfjordur (a port in a fjord – from Icelandic) is a small town about 10-15 minutes drive from Reykjavik. Actually it is now already considered to be a suburb of Reykjavik – it is hard to distinguish border between Reykjavik, Kopavogur and Hafnarfjordur. But still, the locals are trying to highlight that Hafnarfjordur is a town on its own. The town is known for having the main Christmas market during the weekends of December (which is still quite small even by the standards of Latvia). The locals also believe that the town is home to elves and other hidden people. 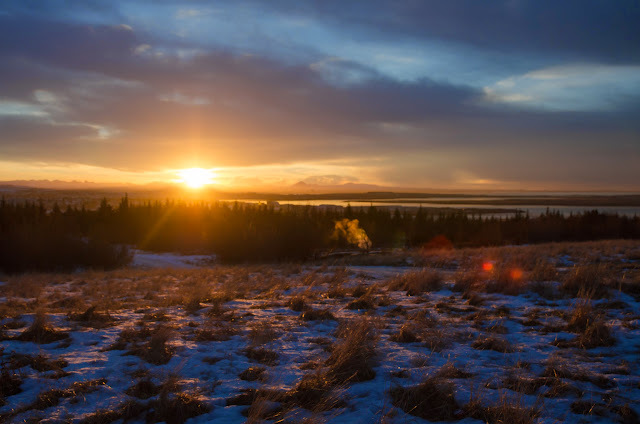 By the way – that is one of the Icelandic peculiarities –people believe in elves, hidden people and other mythical creatures (so be really careful with jokes regarding this, they have they own traditions and rights to believe in whatever they want). 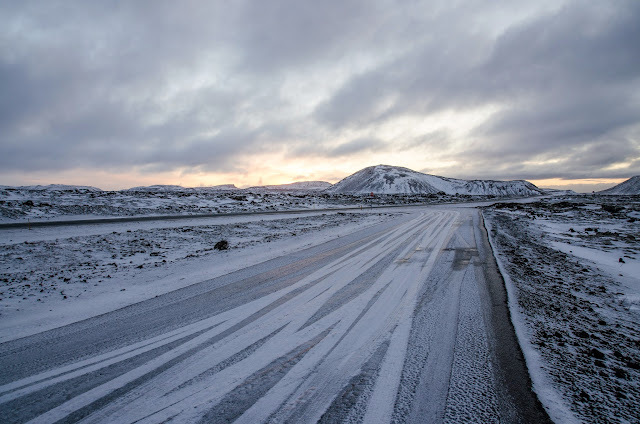 The weather conditions in all 9 days that we spent in Iceland were approximately the same. Temparature fluctuated in the interval from -7°C to +2°C – it depended on the part of the day, direction of the wind, region in Iceland or other to us unknown factors. It was snowing some 2 or 3 days, but on overall we didn't have a lot of snow falling from the sky. Though, the thing you should take into account – the wind is strong. Usually the wind was blowing with a constant speed of around 8 meters per second, but sometimes wind easily reached 20-25 meters per second or even more. In one of the days we were virtually crawling around Reykjavik – the wind was so strong that you could get around the city only in a 45° position. J You should open the door of your car very carefully – the door can catch the wind and at will be damaged or you could get injured – so pay attention to the strong wind gusts. Besides in the force of ocean the air and respectively the wind is very humid. That makes the wind even more unpleasant. In Iceland we understood that a combination of -4°C, large humidity and strong wind is much worse that simply -20°C in Riga. And you should remember that weather changes very rapidly in Iceland. 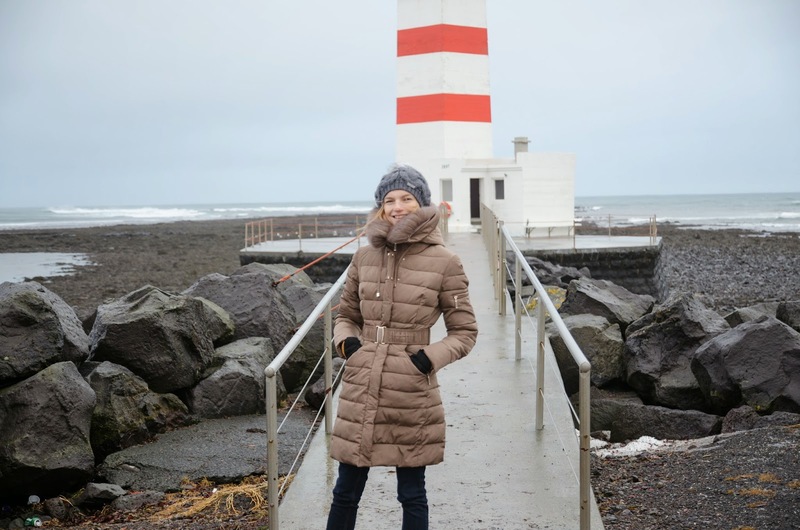 If you're going to visit Iceland and planning a trip outside the city, then you definitely should dress warm, preferably in multiple layers so the wind won't get you. 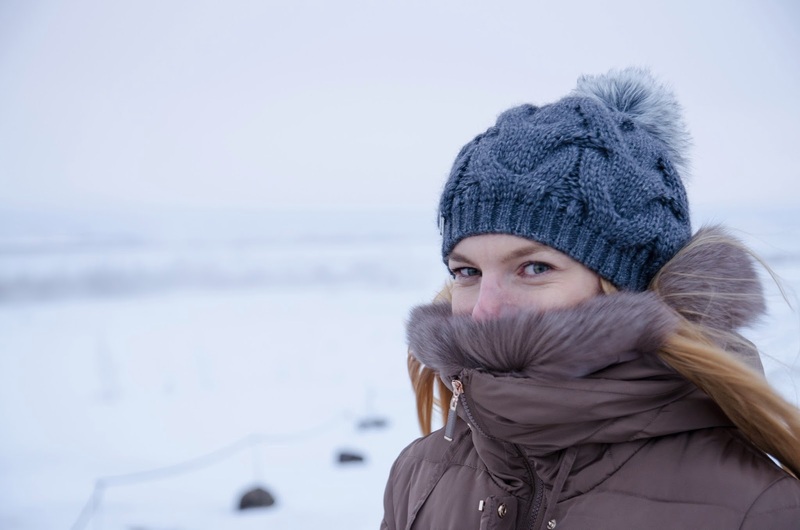 Those people who have a dry skin shouldn't forget about moisturizing cream – it is easy to get frostbites in the wind. The other thing – you should wear boots that don't slip on the Ice. It is very easy to fall on the streets and around Geyser or the waterfalls – it is icy almost everywhere. And as I noticed Icelanders don't use salt to melt the snow. Sometimes they strew the streets with black abrasive lava sand (that really helps a lot), but usually the streets are simply very, very slippery. I was lucky, in our trip I fell once – by the Geyser. I had my camera in one hand, so I had to fall and preserve my camera. I suppose it looked quite funny, I fell on the ice, but the hand with camera was raised up. Anna was laughing for the remainder of the trip. The same story is on the roads – they don't use any salt or ice melting liquids (and that's definitely good for the environment). Only the black lava sand, that really helps the car to get stability on the road. On the other hand – I was thinking about the tires. I suppose they wear-off quite fast because of the abrasivity of the black sand. In the first day in Iceland we mostly walked around Hafnarfjordur. We went to the local bakery to enjoy tea and some buns, we also visited the first shops in Iceland and at that moment we really realized the price level in Iceland. Firstly, the prices are in thousands because of the exchange rate. Secondly, you get the shock when you calculate in your head the price in your currency. You'll calculate once more, and again, because you won't believe the outcome. :D The price level difference between Iceland and Latvia was huge, but it is still considerable even comparing to the vast majority of European countries. Grocery prices were about 1.5 times higher than in Latvia, on some items even more. I suppose that's somewhere 1.3 times higher than on average in central Europe. Meat and all kind of imported goods are especially expensive. The same applies to alcohol and tobacco. The prices are quite ok for all the local dairy products. Iceland has three grocery store chains (as far as we saw it) – Bonus (the cheapest one), Kronan (middle-class) and 10/11 (which was the most expensive one, but mostly because of the location and the long working hours). It was weird for us to see that all products that need to be stored in coolness in Bonus were put in one large room with a temperature of around +4°C. So if you for example would like to have a piece of cheese, you would have to go into this "fridge". J That was really weird – haven't seen this kind of shop anywhere in the world (but I suppose it's quite economically to store all these products in one separate and cool room). In winter it seemed ok, but I was wondering – what would we do in the summer – it would be simply too cold to get the cheese if you're dressed in shorts and a t-shirt. :D If you look for fruits and vegetables you will notice, that vast majority are imported – mostly from US and Europe. Nevertheless in the last years Icelanders are starting to produce more of fruits and vegetables in their greenhouses. Taken into account the low heating energy prices in Iceland it's a miracle that this industry hasn't been popular till now. I suppose that vegetable and fruit export will gain a share in the export structure of Iceland in the forthcoming years (currently the largest part of exports consists of fish products and aluminium - because of the cheap energy it is cost efficient to run aluminium plants in Iceland). You can use your plastic cards almost everywhere in Iceland – even in a small hot-dog stand in a small town outside the main tourist attractions. Sometimes they are not accepting AmEx, but if you have Visa or MasterCard you shouldn't worry about the payments and exchange of money. Thru the entire trip we didn't use more than 15000 ISK, although we could have not used them at all. The only thing where you need cash (and precise amount of cash) is the public transport. You have to pay cash in the bus, and the bus driver doesn't have any money to give you back the remainder. By the way – alcohol and tobacco is sold in separate stores – you won't find them in grocery stores (or at least we didn't find any J). The first thing that surprised us was the sulphur smell. Hot water everywhere in Iceland has the smell of sulphur. At the beginning that feels quite weird, but you’ll get used to it. Back here in Latvia, people are paying a lot of money to get sulphur bath treatments. In Iceland you get it almost free. J The second thing, that was a bit surprising to us – energy efficiency is quite low (not only in this particular house, but overall in Iceland). A lot of houses have old wooden windows, large gaps among windows and doors – the wind is easily blowing inside the rooms. But of course that probably is interconnected with the cheap heating prices – you don’t have to save the energy, you can just turn the heating on stronger! J Our room also was quite warm, but if needed we were able to heat it up even more. The radiator was so hot that you could even prepare breakfast eggs with ham on it. J Anna was definitely very happy with this warm room. As we already said, the hosts had a wonderful dog; she always awaited us by the door and was always very playful. When we lived there, in the next room a family from Canada lived there also. The Canadians (brother, sister and their mom) coming from Quebec were entertaining us on the Christmas evening on 24th December. We had a common dinner (if more precisely: we changed our pork stew for a glass of wine J). So, if you’re searching for a good place to stay in Iceland and you’re on a budget, you should definitely consider this place (especially if you want to get out of a large city). As I already said, the heating energy is really cheap in Iceland. That allows to have an almost phenomena – heated swimming pools all around Iceland. Every town, even the smallest ones have at least one heated swimming pool, and most of them are… outdoor pools. There are various thermal waters which are more or less orientated towards tourists, like for example, Blue Lagoon (which we also visited, twice). But the interesting part for us was the swimming pools for the locals. We visited the large swimming pool complex in Reykjavik – it is called Laugardalslaug (here you can also find a map of swimming pools around Reykjavik). I can surely say that visit of this swimming pool was one of the highlights of our trip to Iceland. Just imagine – large Olympic swimming pool (50m), water is heated up to around 28°C, but outside it's freezing (-5°C). The feelings are very strange – my organism refused to work correctly already after 50 meters – it is simply weird to swim in such a warm pool and to breathe cold air in the meantime - an extraordinary experience. Additionally you have to think about the things you wouldn't back home in your indoor pool – the wind and how to get fast from the swimming pool to the changing rooms (it's freezing! J). 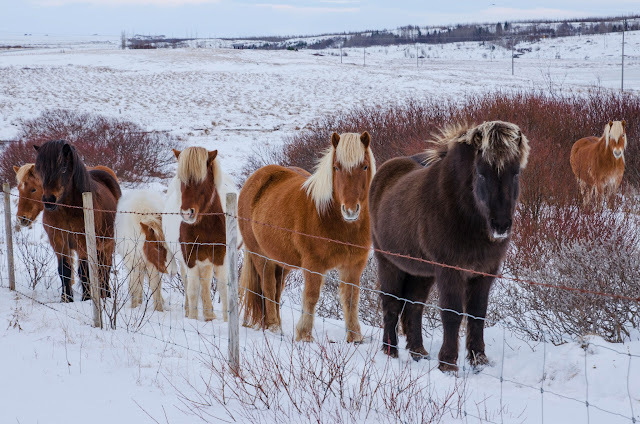 If you're visiting Iceland in winter – this is a must-do. There is of course also an indoor pool and some outdoor Jacuzzis were you can just enjoy the hot water and the clear skies. 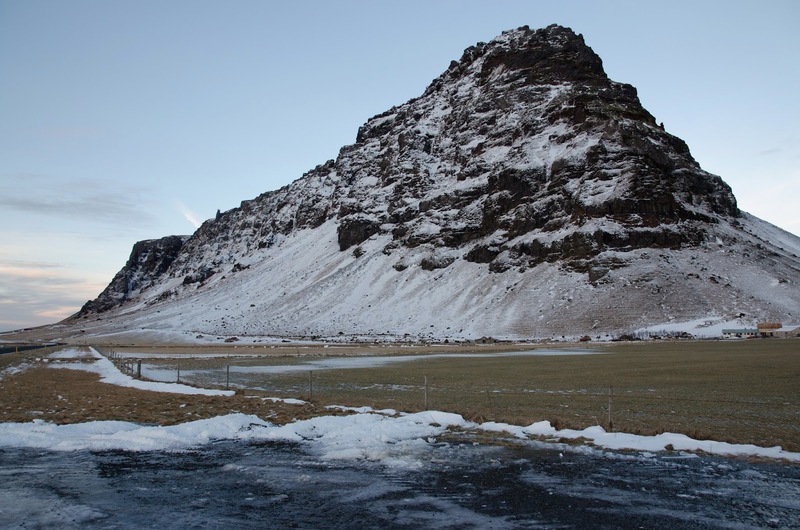 Thank you for your lovely review of your trip to Iceland! I am very much looking forward to going soon!